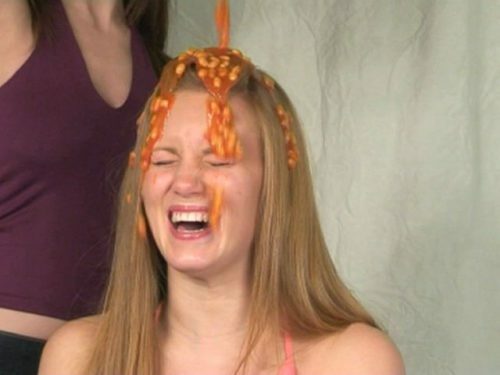 We treated Amber to cold baked beans and warm spaghetti over her head. Amber has been repeatedly been slimed and covered in custard, and at one point… both at the same time. Now, she has been beaned! Amber is also ambitious and wanted a full time role with us. For that, we needed to make sure she could take anything over her head, and it was time to step her up to beans. And because it’s Amber, we made sure they were cold. Was she up to the challenge of cold beans and spaghetti? Well, she squirmed, shrieked and shivered her way through. Because she’s awesome.